Oh scary isn’t it! The red-headed stepchild of minor scales.. unless you’re a Jazz or Classical player that is. If you’re a rock, metal, blues or country player you probably avoid this scale like the plague.. if you’ve ever even learned it at all. What is the big deal? Why is this scale so misunderstood (and avoided) outside of Jazz? I was warming up for my gig on a chilly Wednesday afternoon and was jamming along with some backing tracks on YouTube. During weeks when I have a busy gig schedule, I’ve found that often times an hour or so with some backing tracks is as good a practice as a more technical routine, without taxing my hands too much for the night’s gig.. so that’s what I did. Today I was working with Melodic minor backing tracks and it gave me the idea for this article. Melodic Minor historically was always taught as different ascending than descending. Let’s take a look at an example of that. That’s exactly how my high-School Music Theory teacher Mrs. Bergstrom taught it to me waaaaay back in 1987! You can also find lots of Melodic Minor examples in the music of Bach, Scarlatti, S.L. Weiss and other Baroque Era composers. 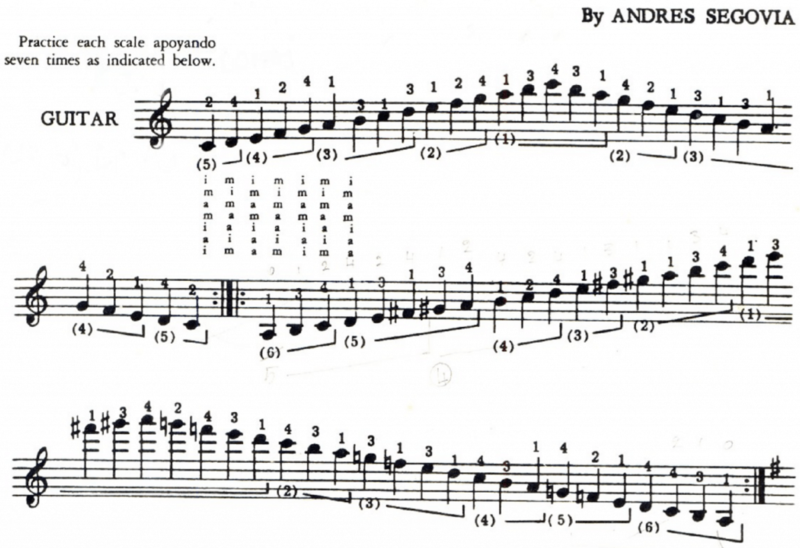 Andres Segovia, arguably the most influential and important Guitarist of the 20th Century, taught Melodic minor this way in his 1953 scale book. Here’s an excerpt from the very first page of his classic book. The first scale is a C Major Scale in 2 positions. 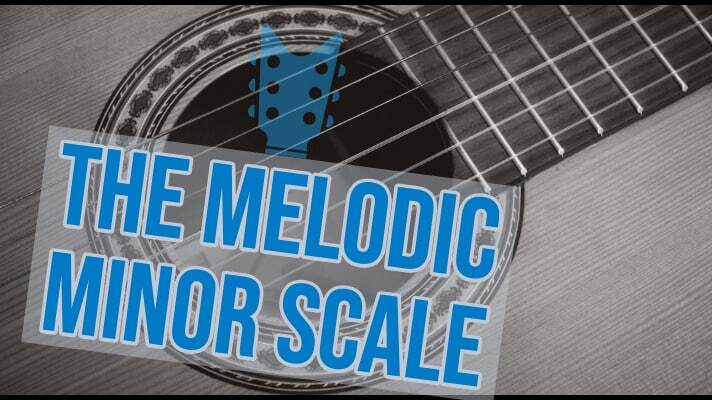 The second scale is A Melodic Minor ascending in 3 octaves and A Natural Minor descending. It’s an awkward scale to play and memorize for sure. Take your time and proceed slowly. Pay special attention to the left hand shifting. I highly recommend his book even if you’re not into Classical Guitar music as he presents some left hand shifts that are useful and not often taught by modern guitar instructors. 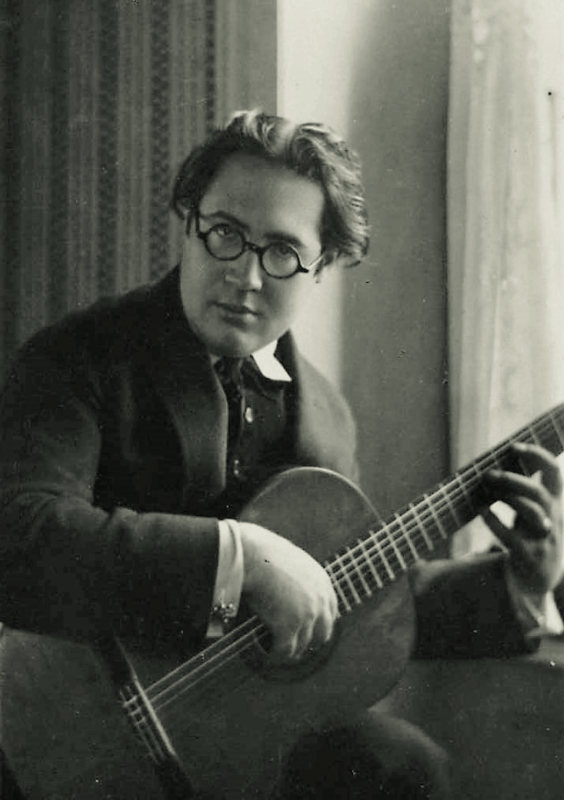 Somewhere along the line in the early days of Jazz and Bebop music, musicians started to find other uses for Melodic Minor as a more fixed formula that stayed the same both ascending and descending. 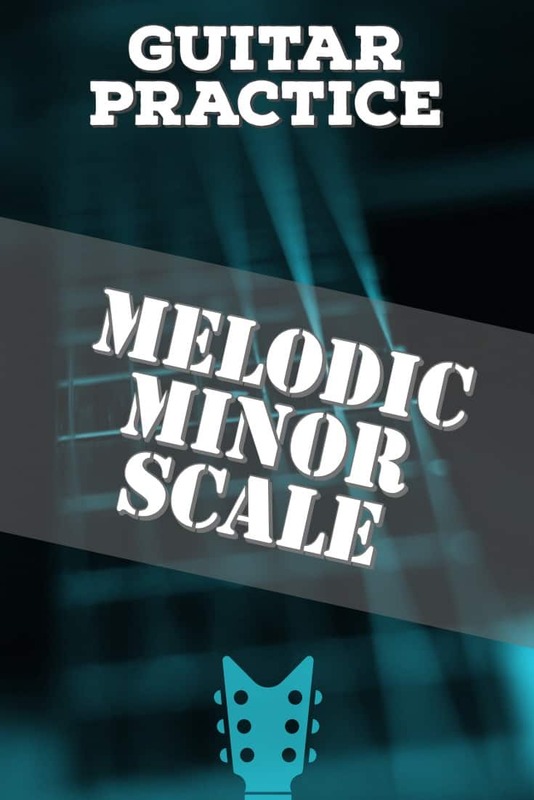 Also commonly referred to as “Jazz Minor”, this scale is widely used primarily in jazz improvisation. My favorite non-Jazz example of Melodic minor is in Journey’s classic song “ Stone In Love” off of 1981’s Escape album. It’s probably no coincidence that this was one of my first cassette tapes when I was a kid and it has gone on to become one of my all-time favorite Rock Albums. It’s definitely a classic and contains stellar playing by Neal Schon throughout. Toward the end of the song before the big solo build up there’s an odd change to the existing G, D, C, G/B chord structure. Want more shapes, printable PDF’s and Guitar Pro Sound Files? Jump on the email list. It’s free and I never send spam. Just lots of Guitar Goodness. Ok, enough examples, right? Let’s start playing Melodic minor all over the neck! Below I’ve included diagrams for 5 Melodic Minor shapes in C. Of course, you can move these into different keys, just pay attention to where the root is on the fretboard. 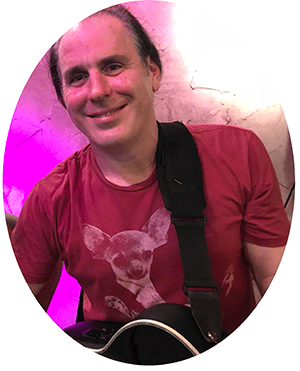 If you’re more into 3-note-per-string shapes, jump on my email list and you can access them in the FREE Guitar Printables area. 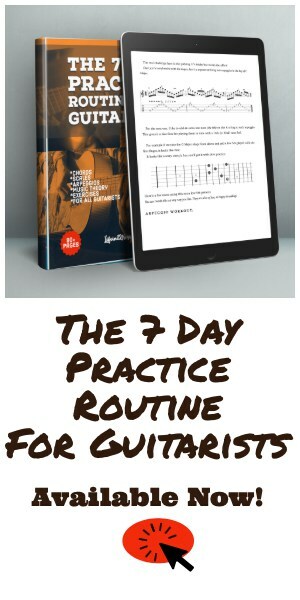 If you like this article and where this is going so far… you may like my book The 7 Day Practice Routine for Guitarists. All of these Melodic Minor shapes and some great exercises are included in the Scale Chapter. In Jazz music, Melodic Minor is used less as a compositional tool and more as an improvisational component to get different sounds over chords.. particularly altered chords. I’m far from a Jazz Improv expert.. but I don’t need to be (and neither do you) to understand the simple theory. I thought of ending this article after the shapes.. but hey, let’s take it a bit deeper and see where we can really go with Melodic Minor. ..wow, that one note really changes some things right? These 4 chords exist in both C Major and C Melodic minor. E minor becomes Eb Augmented. That’s a big change! A minor becomes A minor with a lowered 5th. Once again the ii, V and vii chords remain unchanged but the F Maj7 now becomes an F Dominant 7. The ii chord remains D minor 7 and we get 2 pairs each of consecutive dominant 7ths and m7b5s. You might be asking.. ok great now what can I do with all of this information? If you’re not familiar with these shapes or how to create your own shapes, take a look at my Guitar Chords & Theory Article for a crash course in all things Chord related. The obvious usage for Melodic minor would be to just play it over any of the chords above. This will a yield a cool new sound you can add to your improvisations. 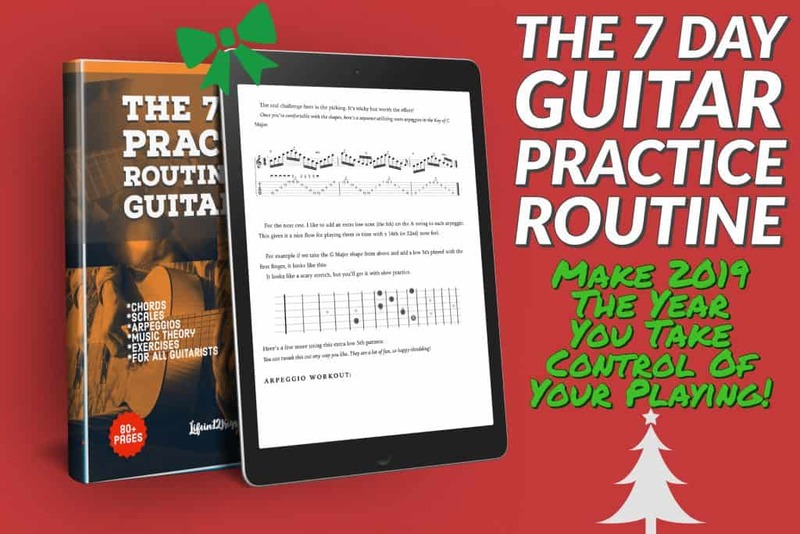 Grab your looper or a backing track and try playing some melodic minor shapes over some chord progressions. It sounds different right? .. but not bad and certainly not “outside”. All of the notes in those 3 chords exist within the C Melodic minor scale so you really can’t hit a bad note. Melodic Minor as an “Altered” Scale. First, let’s take a crash course in Altered Chords. you’ve probably played some and I’m certain you’ve heard of them.. but what exactly are we talking about here? Remember that “Jimi Hendrix Chord” you learned when you first picked up the guitar? Thats a Dominant 7#9. You’ll see altered chords in just about every genre of music but most commonly in Jazz progressions. Record yourself playing a G7 vamp on your looper or grab a G7 backing track. Pretty nice match up right? A good set of chord tones including some Jazzy extensions like the 11th and #5. Wow.. now we got us some meat and potatoes! We’re going to get some really cool altered dominant sounds with this usage. Try some others too, like “Up A 5th”, “Up a 1/2 Step”.. the possibilities are endless!